1. Of all the companies to apply for, why did you want to work at Google? Googlers are known to be incredibly smart and talented. But more importantly, they are enthusiastic, caring and passionate people. The work environment is very collaborative, and I’m really drawn to that. You can find interesting and challenging problems at any tech company, but I really think the people here set Google apart. 2. In what way(s) has Google impacted you, and how have you left an impact at Google? At Google, you’re not just impacting the company, but impacting the millions of people that use Google products. I work on the Google Docs frontend, which means that I get to create features that users around the world see and use every day. Being given that much responsibility is both motivating and inspiring. 3. What is the most interesting/exciting thing that you have been able to do as a Google intern? Your “Magic Moment”? 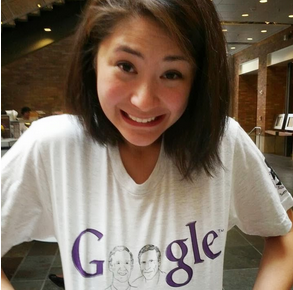 During my first Google internship last summer, I was asked to design a Google T-shirt for the University of Washington Computer Science and Engineering department. As someone who has always dreamt of being a Google Doodler (the people who draw the doodles on the front page of Google), I was ecstatic to take on this project and draw a doodle of my own. The shirts became quite popular, and even ended up on GeekWire! 4. Aside from working for Google, what kinds of organizations/clubs/activities are you involved with in your community / around your school’s campus? For the past two years, I have been a TA for the Intro Programming courses. I’m also heavily involved with Computer Science K-12 Outreach programs, including volunteering in a middle school classroom to help develop lesson plans and work with students to get them excited about computing. Additionally, I am chair of ACM-W (the Association of Computing Machinery, Women’s Chapter) at UW. We work on building a welcoming and supportive environment for women in the CSE department. 5. What types of lessons/skills have you learned at Google that you will take back to school after this summer ends? I’ve met some of the most amazing people here at Google. Both my mentor and my host have been so encouraging and supportive, and have allowed me to grow not just as an engineer, but as a person. I think my main takeaway from the summer is to be confident in yourself. It’s a cliche (and even odd) piece of advice to get at a tech company. But I think it’s really easy at an internship to get stressed out, focus on impressing people, and worry about what people are thinking about you and whether you’re doing good enough. It’s neither sustainable nor productive. 5. Any advice for students interested in being a Google intern? Be passionate and ask questions. Being a good intern isn’t about knowing a lot, but growing a lot. (I know, super corny advice.) No matter where you are in your education, or how long you have programmed, you should always focus on working hard, learning, and constantly improving. If you do these things, you’re going to be successful. Unreal Peanut Butter cups. Sooooo good. But so bad for you. Interested in applying for internships at Google? Check out google.com/jobs/students this fall to learn more about our opportunities. 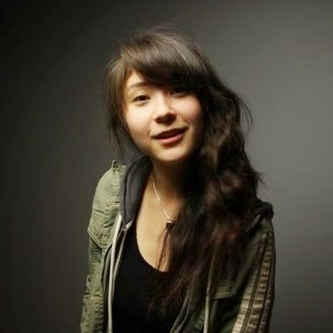 For our today's 'Better Know an Intern' post, meet Zorah Fung, a software engineering intern on the Google Docs Team in New York. Zorah is a rising senior at the University of Washington, double majoring in computer science and interdisciplinary visual arts. Fun fact about Zorah: one of her life goals is to own and be able to play every musical instrument in the world. She's already accumulated about 20!